The King of Atlantis steals the show in Marvel’s newest Invaders revival. You might think Namor would be having a rough go of things lately, between the fact that his rival Aquaman beat him to the big screen and that Namor hasn’t had a solo comic to call his own for quite a while. But far from it. Between books like The Avengers, X-Men Red, the recent Defenders: The Best Defense crossover and now this new incarnation of The Invaders, Namor is really being given his due in the Marvel Universe. 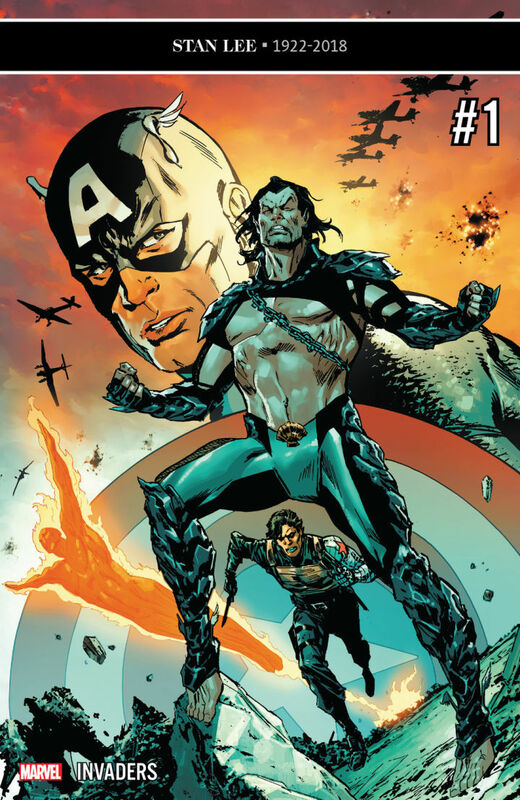 Make no mistake – while this series ostensibly revives the WWII-era superhero team that also includes Captain America, Bucky Barnes and the original Human Torch – this is very much Namor’s book. The Invaders #1 builds on recent events in The Avengers and The Best Defense, with Namor taking on a more antagonistic role towards the surface world than ever before. Rather than rejoining his old teammates, he’s now the all-encompassing threat they have to rally against. And the key to victory may tie back to a conspiracy decades in the making. Thankfully, writer Chip Zdarsky maintains an evenhanded approach to Namor’s characterization throughout the story. Never does Namor comes across as an outright villain. He’s painted as a man with legitimate grievances against the surface world, a place he’s risked life, limb and gill to defend many times. He’s also depicted as a man dealing with dissension among his own ranks, with some of Atlantis’ oldest and fiercest warriors doubting their pink-skinned leader. If Namor is written as unstable and unhinged, he’s certainly given ample reason to be. The recurring flashbacks help a great deal in this regard. The emphasis on the exploits of the WWII-era Invaders shines a light on a simpler, more honorable time in Namor’s life and the ways he struggled to reconcile his connection to the surface world even then. Zdarsky excels at finding the man beneath all the muscles and arrogant charm. The promise of a new mystery set during Namor’s lost period as a wandering amnesic only further adds to this book’s appeal. It is unfortunate that the rest of the main cast don’t stand out as much as Namor himself. It really does help to approach this comic as more a Namor-centric character study than a true ensemble superhero book. But perhaps as Zdarsky finds more time to dig in with characters like Torch and Winter Soldier, that problem will fade. This issue uses its two artists to maximum effect, with Butch Guice handling the flashback scenes and Carlos Magno the present-day material. Guice’s moody, scratchy style expertly captures the somber tone of the flashbacks and creates a throwback, Golden Age-inspired quality. Magno’s work has a smoother, more modern flair to it. The two style manage to gel so well largely because Guice and Magno take a similar approach to page design. At times the book is able to veer from one artist to the next on the same page without missing a beat. This issue does suffer at times from Magno’s over-reliance on extreme camera angles. Too many panels are too tilted so that figures either loom from above or are framed from an almost bird’s eye view perspective. Rather than lending an added sense of energy to the page, these extreme angles merely become distracting and strange.